Well, I’ll be a Dutchman! When Australia arrived in England for the Ashes series of 1953 they had held the urn for nearly twenty years. Without the remarkable rearguard action of Trevor Bailey and Willie Watson at Lord’s in the second Test they might have held on to them a bit longer, but as it was after four draws England triumphed at the Oval, and the Ashes came home at last. After the third Test of the series the Australian schedule briefly took them away from the British Islands to mainland Europe and, for the first time ever, a clash on the cricket field with the Dutch. The venue for the single innings one day match was De Diepput in The Hague. The Australian eleven lacked Ray Lindwall and Bill Johnston, but it still comprised eleven international cricketers. Their Dutch hosts had not a single First Class match between them, and indeed only one of their number, opening batsman Bill Glewer, ever would have. Glewer played once for the famous wandering club the Free Foresters against Oxford University in 1957, by which time he was 45. Visiting skipper Lindsay Hassett won the toss and had no hesitation in deciding to bat. The matting wicket was unfamiliar to the Australians, and the Dutch bowled steadily, but a total of 279 always looked like it was going to be plenty, and so it proved to be, the Dutch falling 157 runs short. The extent of the home side’s discomfort was amply demonstrated by the fact that half their wickets fell to a combination of Arthur Morris, Neil Harvey, Don Tallon and Hassett himself. Between them the four played in 189 Tests, in which they took a total of just five wickets. The next time the Australians visited The Hague was eleven years later in 1964. This time round the match was late in the tour, the Ashes series already done and dusted and won 1-0 by Bobby Simpson’s men. Some had written off Simpson’s men before the series started, the retirements of Richie Benaud, Alan Davidson and Neil Harvey having left some big holes in the side. Despite that, and losing as many as three of their matches against the counties, England never looked like winning any of the Tests. Like all Dutch cricket grounds (at the time there were only around 50 clubs in the country) De Diepput was used as a football ground in the winter. There were just a couple of small stands, and a brightly painted pavilion with a small terrace in front of it. It would be interesting to know exactly how many people were packed into the ground on that warm day in late August. According to an account written by Norm O’Neill some years later there was a capacity crowd of 15,000, but a contemporary account suggests the figure was nearer 3,000. Given that most were said to have been sitting round the boundary in deck chairs it seems likely that O’Neill made a misjudgment. Before looking at the remarkable game of cricket that followed it is worth a brief digression on the subject of the wicket. The Australians were, of course, used to playing on turf wickets, whereas all Dutch cricket was played on a mat. A 22×3 yard trench was dug, filled with gravel, top dressed with a hard tennis court surface before, finally, a heavy coir or jute mat was stretched across it. Matting wickets produce a true and reliable surface. They are usually quicker than turf wickets and encourage spinners. The ball will generally rise more quickly than on a natural surface, meaning that a good length delivery from a pace bowler, or one from a spinner that is given a good hard tweak, will probably go over the top of the stumps. Swing bowlers generally suffer, due to the abrasive nature of the mat quickly eradicating the shine on the ball. An added problem for pace bowlers is getting use to the switch, as they enter their delivery stride, from turf to mat. On the plus side a damp mat will offer a much firmer foothold than a rain-affected turf wicket. For batsmen the bounce on the mat means they need to be careful when cutting, pulling or hooking until they get used to the surface, and driving too creates traps for the unwary. Apart fom a single Test missed by O’Neill Australia had relied on the same eleven men in each of the Tests against England. Three of them were rested for the game against the Dutch and an injured finger kept Simpson out. Hockey international Brian Booth took over the captaincy. But the Dutch too could claim that they were not at full strength. Nico Spits, an attractive batsman and the finest wrist spinner in the country’s history was unable to play. Like Booth a fine hockey player Spits had, as a member of the Dutch side for the forthcoming Tokyo Olympics, a more pressing committment to play against Great Britain. None of the Australians had played in the corresponding fixture eleven years earlier, but three of the Dutchmen had. 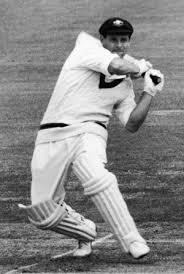 Their bowling success in 1953, Ernst Vries, had taken 4-85 with his right arm medium pace. In 1964 he was 30, and had been his country’s outstanding bowler for some years. The Dutch skipper and a doctor of medicine, Peter van Arkel, had been just 17 in 1953, and had top-scored against Hassett’s men with 34. Well over six feet in height and making full use of his height he was a quality batsman. Finally there was Walt van Weelde, at 42 the veteran of the side and, at the time, the leading all-time run-scorer in Dutch cricket. Booth won the toss and, like Hassett before him, chose to bat. Van Arkel took the new ball but did not bowl well. His opening partner, the rather swifter Ben Trijzelaar, did not start too brightly either, but he achieved a breakthrough with the score on 15. Bill Lawry played a legitimate leg glance only to see the aging Van Weelde taking a superb catch just inches from the ground. When the same bowler castled makeshift opener Wally Grout at 36 the Dutch were beginning to warm to their task. With O’Neill and Peter Burge now at the crease the Dutch change bowlers appeared,a pair of medium pacers in Vries and WA Pierhagen, the latter a left armer. Neither batsman was keen to get on the front foot, doubtless by virtue of not having complete trust in the mat. Burge never looked entirely comfortable, particularly against Pierhagen who eventually dismissed him when the score reached 91. One of the keys to the Dutch success was their keen fielding, and just one chance went down. It might have been an expensive one though, O’Neill being given a life at 15. He went on to comfortably top score with 87. After Burge was dismissed Booth helped O’Neill take the score to 120 before, attempting a big hit, being caught on the boundary. From comments made later by spectators it seems that Pal Bouman’s foot was over the boundary when he took the catch, but no one on the field raised the point. Booth’s place was taken by uncapped Victorian Jack Potter and Trijzelaar came back into the attack. It wasn’t long before Potter went to pull a shortish one but played too early and was struck on the temple. There was a sickening thud and Potter retired hurt. He suffered a fractured skull and whilst his teammates left England for a tour of India and Pakistan he stayed in London receiving treatment until November. He did play the game again, but never got the chance at Test level that the trip to the sub-continent would almost certainly have brought him. Following Potter’s accident Bob Cowper did not last long before giving Trijzelaar a return catch. By now O’Neill had moved up a gear and was scoring fluently until eventually he took one risk too many and was stumped by 20 year old Rene Schoonheim from Pierhagen’s bowling. After that, try as they might, the Australian lower order was never able to escape the straitjacket that the two medium pacers put on them and after 50.1 overs the innings closed on 197. Pierhagen and Trijzelaar both took three wickets and there were two for Vries to go with the four he took in 1953. Despite the Australians’ relatively low total, on a small ground, there was no real expectation amongst the spectators between innings. The Dutch had never before scored more than 130 against a Test playing country, and had generally failed to get close to even that modest total. In addition they were facing Australia’s Ashes spearhead Graham McKenzie, and although the other two components of the test pace attack, Neil Hawke and Grahame Corling, were missing Alan Connolly was a quality bowler. The Dutch openers were Piet Marseille and Pim Van Der Vegt. Their task was made harder in that having weathered the early onslaught they had to go off the field during a brief shower, so they had to settle in twice. To their advantage however was that second time round McKenzie had to lose a yard or two of pace, unable to use his long studs on the mat. Marseille had, a couple of years previously, scored a century against Hampshire and was by some distance the more fluent of the pair. At just 19 Van der Vegt lacked experience, but not courage or that bit of good fortune that is always useful, and the pair came within a whisker of a century opening partnership, McKenzie finally getting through Van der Vegt’s defence as the Dutch reached 99. The youngster had scored a valuable 33. The Dutch number three was their skipper Van Arkel, and he and Marseille made sure there was no clatter of wickets. At 129 Marseille finally went for 77, and a little later, after a fine 45, Van Arkel joined him back in the pavilion. Both were the victims of Cowper’s off spin. At that point there were 47 needed for victory with 40 minutes left. The aggressive Van Veelde did not last long and Dutch eyes, with McKenzie and Cowper bowling well, turned towards a draw, a view reinforced as Bouman and Vries also fell victim to Cowper. The Australians would have been forgiven at that point if they had simply closed the game down, but to Booth’s great credit they carried on looking for victory, McKenzie bowling at full tilt, and Cowper trying to lure the batsmen to their doom. With three overs left 17 were needed. Rudi Onstein, a big hitter with an unreliable defence, was facing Cowper. He was one man who was certainly not looking for a draw and he drove Cowper for six, after which he and Albert Wijhuizen played tip and run and took a couple of harum scarum singles to leave Wijhuizen on strike. When he was unable to get a run from McKenzie’s next over the equation was nine from six deliveries and Onstein on strike. He started with Plan B, and another couple of singles that depended on luck more than judgment, before reverting to Plan A and a big straight six to bring the scores level. The fourth delivery of the over was pulled to the boundary and David had slain Goliath. One of the crowd wrote later Even before the ball reached the boundary a roar was on its way up from 3,000 throats, and hats were flung into the air as hundreds of people ran out on to the field. The result of the match doesn’t seem to have attracted too much comment at the time. The Cricketer does not mention the giantkilling at all. Wisden gave only the briefest details, and described the match as carefree, although the serious injury to Potter was noted. As far as accounts of the tour in book form are concerned Lyn Wellings made reference to the match only in passing, and did not make mention of the result. John Clarke also dealt with the trip in a solitary sentence, although he did at least inform his reader that the Dutch had won, but he made no further comment. The Australians were magnanimous in defeat. O’Neill wrote later I can assure you we tried our hardest to win. He didn’t blame the mat either, acknowledging that most of his teammates had cut their cricketing teeth on such surfaces. His observation on the opposition was something of a back-handed compliment though, that enthusiasm dwarfed technique. Perhaps surprisingly it was to be another quarter of a century before, in 1989, Alan Border took another Australian side to the Netherlands. There were two fifty over games played this time, again at De Diepput, and again after the Ashes had been won. There was no fairytale this time round, as the Australians won both games. The first was won comfortably enough by 57 runs, although the Dutch certainly did not disgrace themselves. The second was won on a faster scoring rate at a point, in a low scoring game, that Australia needed another 23 with four wickets to fall. They would probably have got there, but the hosts had proved themselves to be rather more competitive than England had been in the Ashes series just ended.